One of the most frequently asked questions we get is "How do the ATV Wheel offsets work?" The offset of a wheel will determine where the wheel sits in relation to your vehicle. Every rim has an offset that consists of 2 numbers that are measurements. The first number is the measurement (in inches) from the inside lip of the rim, to the center of the rim where the hub and rim meet. 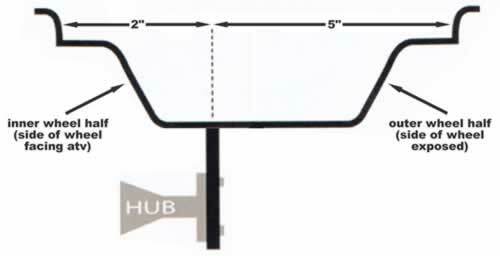 The 2nd number is the measurement (in inches) from the hub to the outside lip of the rim. 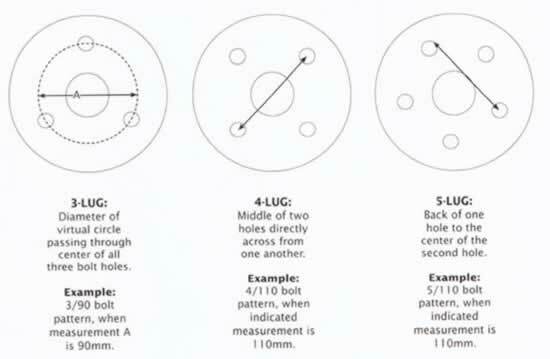 For example: An ATV wheel with a 4+3 offset will measure 4" from the inside lip to the center of the rim where the hub and rim meet, and then it will measure 3" from the hub to the outside lip. The two numbers added together will total the overall width of the rim. Here are a few pictures and some additional information to help you understand ATV rim offsets. Positive Offset vs. Negative Offset? Correct wheel offsets for STRAIGHT REAR AXLE models? Correct offsets for INDEPENDENT REAR SUSPENSION? OPTION 1 - You can buy rims that are all 4 the same width. If you buy rims that are the same width front and back you will want to get the same positive offset rim for the front and back. For example, a 5+2, 4+3, or 6+1 (depending on your machine) and you would buy the exact same offset for the front and the rear. This works great even though most factory rims are two different widths. You don't have to stick with that, you can buy the same rims front and rear and run the same size tires front and rear or you can get two different widths of tires and mount them on the same size rims. OPTION 2 - You can buy rims that are two different widths. There are some rims out there that are offered in a skinnier size for the front and a wider size for the rear just like your factory rims. If you go this route you will still want to run a positive offset for both the front and the rear but they will not be the same offset because they are two different widths. For example, you would order a 4+2 or a 4+3 for the front and a 4+4 or 5+3 for the rear, it would just depend on what is being offered for the style of rims you are buying. Correct wheel offsets to WIDEN MY STANCE? Wide stance offsets (aka negative offsets) can only be used on ATVs or UTVs with the Independent Rear Suspension, and they are not available in all fitments. They are generally used on UTVs to widen the stance & increase stability. However, they can also be used on some ATVs if you are looking to widen your stance and make your machine more extreme and aggressive looking. In order to widen your stance substantially you would want to order a rim with a negative offset, so the first number is smaller than the second number. For example, 2+5, 3+4, 3+5. Another option to widen your stance is to use wheel spacers. A 5+2 offset is the most standard offset when it comes to ATV wheels. The face of the rims is closer to the exposed edge and the majority of the rim & tire sit in underneath your ATV. The 5+2 offset is used on the front of almost any utility ATV/UTV. A 5+2 offset is also used on the rear of any Independent rear suspension model ATV. If your ATV has the independent rear suspension it will use the exact same offset on front and rear when you buy aftermarket rims. 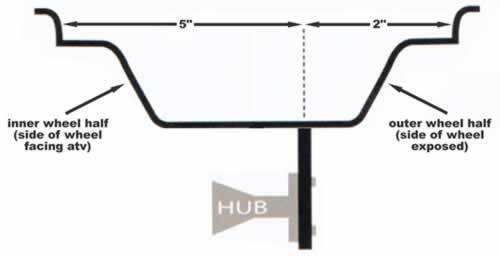 If your ATV has the straight rear axle you'll need to order a different offset for the rear which is shown below. A 2+5 offset is most commonly used on the rear of any ATV that has a straight axle on back. These are commonly referred to as "deep dish" or "negative offset" wheels because the face of the rim is recessed in about 5" from the outside edge. 2+5 offsets can also be used on front and rear of an independent rear suspension model ATV/UTV if you are looking to increase the width of your machine and gain stability. A 2+5 offset wheel will stick out about 3 inches wider per side from the standard 5+2 offset wheel. When measuring your ATV's bolt pattern you will want to check both the front and rear. Some ATV models use a different bolt pattern on front and back so you'll want to double check yours before purchasing new wheels. You can also view our ATV Bolt Pattern guide to find out.